Apollo, the company intent on making a hypercar that’s both hugely powerful and delightfully old school, is in Geneva for the auto show. But it’s not actually in the show. Why? Apparently it wants people to see its car on the road, in real life. 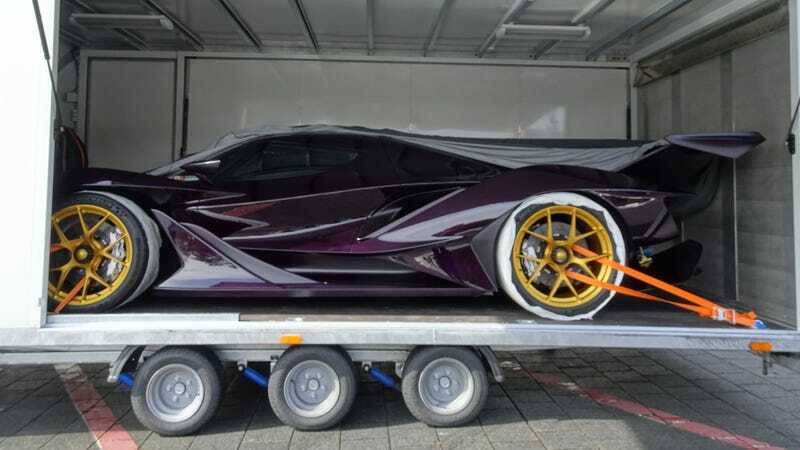 The IE, short for Intensa Emozione because that’s what’ll happen when you drive it, is a pointy, shouty, angry V12 monster and if you’re into naturally aspirated motors you’ll probably want it all over your face as soon as possible. If you’re lucky enough to be in Geneva for the next couple of days, you might actually get to put your face near it. Bucking the trend of taking a fast car to a show full of fast cars, Apollo has its own little base not far from the show itself. In its inflatable palace sits one of the two built IEs and every now and then it’s going to be doing laps of Geneva for people to actually see. The marketing angle is that over the next few days, if you spot the car and take a picture and tag it #FINDTHEIE on some social network, the company just might hit you up to get a ride in the passenger seat of this bespoke beast. Which would actually be pretty sweet. It’s a pretty cool way to do things, rather than hide its latest wares behind a set of doors and a press pass or an entry fee, Apollo’s decided to take its stuff to the people. They make cool stuff, people like cool stuff, why keep it under wraps? The first customer cars should start rolling out by the end of 2018, so I guess we’ll find out then.